Written by Rosemarie Parent using archival information stored at the Arrow Lakes Historical Society in Nakusp, B.C. In 1898, the SS Minto and her sister ship, the SS Moyie, were to be assembled in Vancouver and sent to the Stikine. However, just before the work commenced, the CPR directors decided it would be a waste of time and money to send more ships to that area. Because of the mining discoveries and fast-growing development on the Arrow and Kootenay Lakes, they decided instead to send the pieces of these prefabricated boats to Nakusp and Nelson to be assembled immediately to participate with transportation on those lakes. The CPR also anticipated the early completion of the Crow’s Nest line and would need boats to work the lakes. The CPR also required a steamer on the Arrow Lakes that would be able to cope with winter conditions. To contend with the heavy ice, the sides of the Minto’s hull were clad with iron. A major alteration was made to the original plan when they extended the length of the boat by 20 feet. This made possible the transport of more supplies that were necessary at this time for all the businesses that were springing up in the small towns on the lake and the residents that were ready to start a new life here. On November 19, 1898, the Minto slid off the ways into the lake. There was still work to be done inside the boat, so her maiden voyage was not until December. Her first crew included Captain John Gore, Mate William Kirby, Chief Engineer Jack Fyfe, Second Engineer Jack Young and Watchman Walter Wright. There would be many more captains and crew members over the years she worked on the lake. Many of the crew and kitchen workers were people living in the area. They all have fond memories of their experiences on the vessel. There were several other boats built over the years. The SS Bonnington was the largest and most impressive. Because of the building of the Kettle Valley Railway and the use of new roads for vehicles, she became redundant and was parked in 1931, not to see service again. 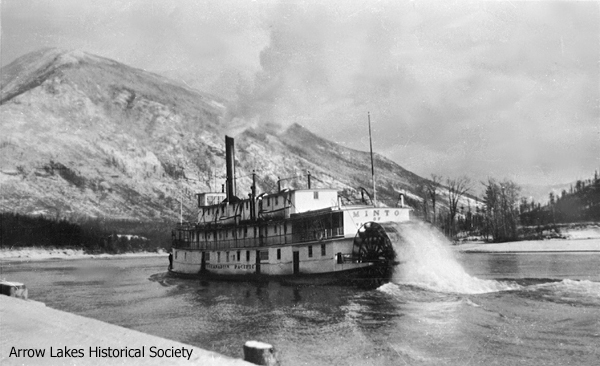 The Minto was the last boat to look after the 120 miles of water in the Arrow Lakes, serving the loggers, farmers, trappers and tourists. She carried cattle, horses and freight until 1954, when the CPR removed her from service. This was a great hardship to Halcyon Hot Springs and St. Leon Hot Springs because there were no roads to these resorts at that time. There were other tugs that were used but the Minto was sorely missed. 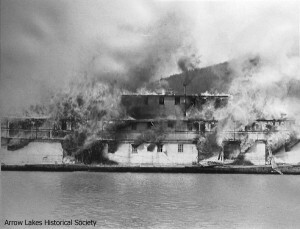 The SS Minto Preservation Society was formed in Nakusp when the CPR gave her to the town for a dollar, but in May 1956, because of lack of public support and the vandalism that had occurred on the boat during the past two years, they sold the steamer to the Columbia Trading Company of Nelson. The ship was to be dismantled and sold for scrap. They tore out her boilers, her sternwheel and her brasswork. However, John Nelson stopped the breakup of the boat and bought her from the wrecking crew for $800 and with his son Walter took over custody of the Minto. James Millar of Beaton towed her to Galena Bay in July of 1956 with the tugs, Octagon and Pentagon. Several movie cameras were on hand to record the boat’s last journey. John Nelson’s plans to preserve the historic craft were not completed and from the time he had bought her 12 years previously, the Minto slowly rotted away. When John died in 1967, a decision had to be made because of BC Hydro’s work on the lake, readying the shore for the reservoir. They offered to move the boat and had a marine surveyor estimate the cost of moving and restoring the boat. At that time, it would have been about $100,000. Walter could not, as an individual, provide the funds to do this and he had no recourse but to allow the removal of the Minto to the middle of the lake were he lit the torch to end her existence. The hull sits there still at the bottom of the lake off Galena Bay shore.